Prepare your taste buds for a classic. 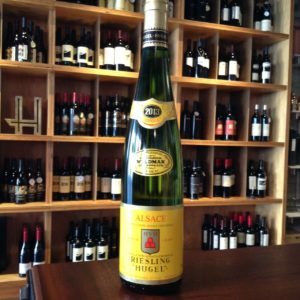 This 2013 Riesling from Famille Hugel in Alsace, France is bone dry with high natural acids and a profound mineral profile. Hugel has been 100% family-run for 12 generations, since the time when they shipped most of their wines up the Rhine to wealthy Strasbourg and Cologne, and when Alsace was the most southerly wine growing region in Europe (wine was not produced in Moorish southern Europe at the time). Today, Hugel is noted in Wine Advocate for the “World’s Greatest Wine Values,” offering exceptional value for quality. This Riesling, from a vintage subjected to variable weather, is lively and bright, crystal clear, with a bouquet of green apple, peach, lime, and almond, and a plush mouthfeel with the usual lashings of acidity. Pair with sushi, grilled trout, or lobster cream sauce over ravioli.